The Nissan Murano CrossCabriolet took its moniker from Nissan’s mid-sized crossover that has been on the market since 2002. But the CrossCab (as is the nickname) is not merely a Murano with the top chopped off. 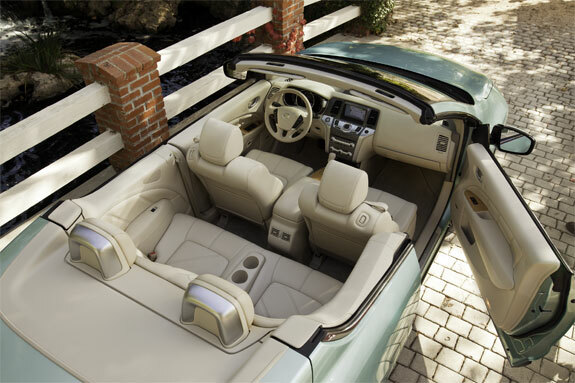 In convertiablizing2 the Murano, Nissan redesigned most of the interior and exterior of the vehicle. (See the graphic, below). Looks. On the outside, the CrossCabriolet’s design has definite WOW factor. Photographs don’t quite do it justice. Just as the camera can add 10 pounds to a person, the CrossCab appears more boxy in photos than in real life. As seen driving down the road, this is one sleek-looking vehicle, especially with the standard 20-inch wheels. Rear seat. The experience of getting into the Cross Cab is unlike a normal car convertible. One climbs up onto the CrossCab. Standing in the back with the top down feels a little like standing on a parade float. Getting in back is easy because the CrossCabriolet is designed to be a true four-person vehicle. One need not be a contortionist fit into the rear seats. There’s adequate leg room for those sitting in the rear’s comfortable bucket-esque seats; there are also two cup holders (at the expense of a middle seat) and air vents. 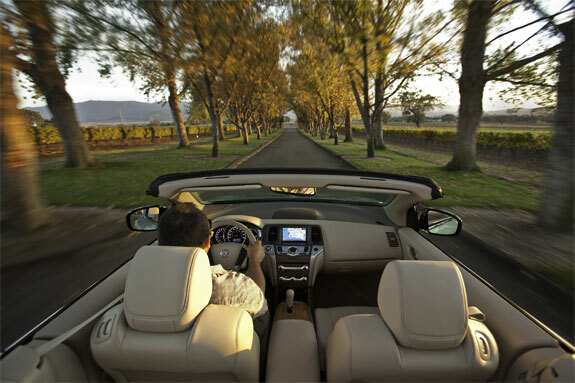 Riding in the rear with the top down is a more windy and noisy experience than it is in the front—this is understandable and the case with all convertibles. But what’s a bit perplexing is that only the front passenger seat has a latch that quickly makes it fold down for rear seat access; on the driver’s side you have to use the relatively slow electronic controls. Also, the front passenger seat doesn’t return to its original position after being folded down to let a rider in back; one has to readjust both the tilt of the seat back and forward position. Front seats. Sitting in the driver’s seat, the Nissan CrossCabriolet feels luxurious. Not as luxurious as many (more expensive) high-end sedans, but one doesn’t get the sense that Nissan cut corners either. 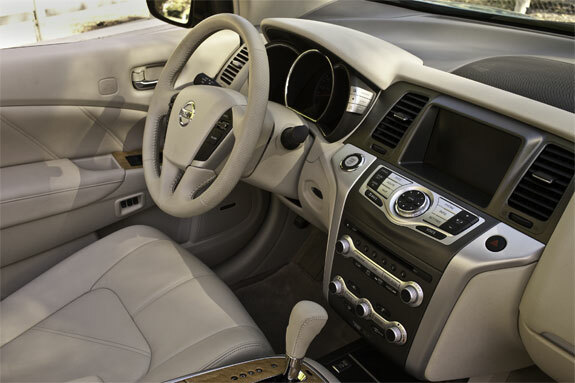 There’s wood grain paneling, double stitching on the leather-appointed seating and a curvaceous design. In fact, a little too curvaceous for Spot Cool Stuff’s taste. 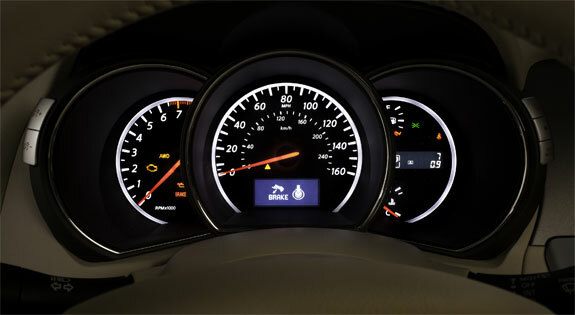 Ourselves, we would have preferred a few more angles on the instrumentation, especially on the GPS controls below the display screen. Convertible top. The Nissan CrossCabriolet has a soft top, though the aluminum and magnesium die casting around the sides makes it feel like you have a sturdy roof overhead. On our stopwatch it took 30 seconds to put up the top and 25 seconds to retract it back into the trunk, thanks to a smooth hydraulic. The system is fully automatic—there’s not even a manual latch lock as on so many other convertibles. Of course, the top does occupy storage space. The trunk has 7.6 cubic feet (215 liters) of cargo space with the down. Even with the top up it has only 12.3 cubic feet (350 liters)—exactly the same as a 2011 Toyota Corolla sedan. (Still, even with the top down there’s enough room in the boot for three cases of wine—and how much more wine does one need than that?). One other nice extra: The CrossCab has a huge lockable glove compartment. Head turning exterior and luxurious interior. More rear seat and cargo space than other convertibles. Poorly designed system of folding down the front seats to get into the rear of the vehicle, especially on the driver’s side. Limited cargo space compared with other crossovers. When weighing the $46,000+ price for 2011 Nissan Murano CrossCabriolet it is key to consider this: The vehicle comes fully loaded. The only dealer options are $500 for a camel-colored interior with a black top or a cashmere-colored interior with brown top. A black interior with black top is standard. As for the exterior, the crossover convertible is available in six colors including two—”Caribbean” and “Sunset Bronze”—that will be exclusive to the CrossCabriolet. (For what it’s worth, we’re partial to the Merlot). What’s not included. Among the features Spot Cool Stuff would argue should be offered at this price point but are not: an electronically adjustable front passenger seat (not only driver’s seat) and a remote starter. We were also a bit underwhelmed by the sound quality of the BOSE audio system. 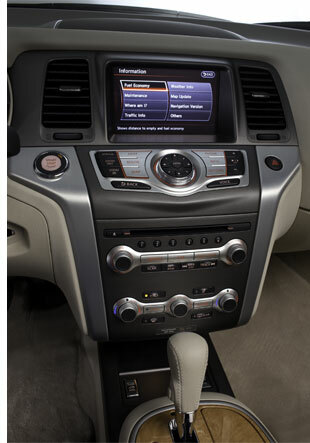 The included Nissan GPS navigation system, however, is quiet good with an above-average feature set and user interface. Fully loaded with several features that are optional—and costly—extras on most other crossover vehicles. 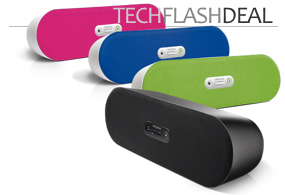 Sub-optimal audio system. 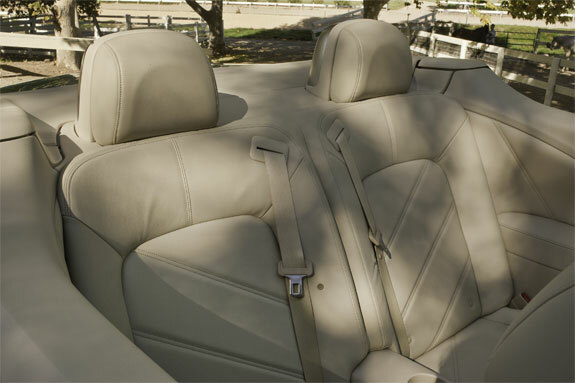 Warm-weather drivers can not opt out of winter features such as heated seats. When asked to describe the ride of the Nissan Murano CrossCabriolet every one of the dozen test drivers we questioned used the same two adjectives: smooth and quiet. Turn on the CrossCab with the push button ignition and the first thing you notice is . . . nothing. No noise whatsoever. At interstate speeds the engine purrs happily and faintly. It’s possible to conduct conversations at a normal volume even when speeding along with the convertible top down. Performance. The V6, 265-horsepower engine feels peppy, if not quick, under everyday driving conditions. Acceleration is constant and smooth when merging onto a highway (say, from 35 to 55 mph) or pulling away from a stop sign (eg. from 0 to 25 mph). But floor the gas pedal, or try pushing the engine hard, and you’ll find the CrossCab has little in the way of reserve power. Then again, those looking for sports car performance would probably not consider this vehicle to begin with. While the CrossCab engine is smooth, unfortunately, it can not be described as efficient. The EPA estimates 17 miles-per-gallon in the city, 22 mpg highway. The onboard computer calculated that Spot Cool Stuff got 16.4 mpg on our drive, which included roughly equal parts city and highway. Nissan recommends premium fuel for the CrossCab. Handling. To Spot Cool Stuff, every SUV (even the crossover ones) either drives more like a car or more like a truck. 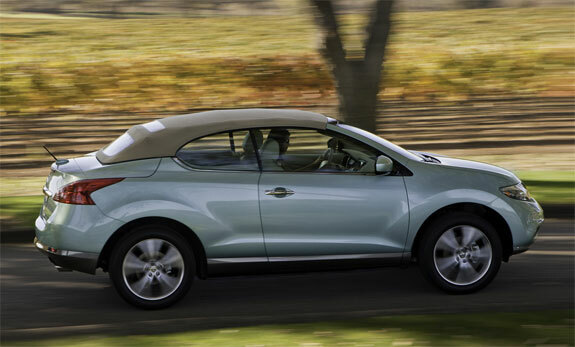 We’d put the Nissan Murano CrossCabriolet in the truck category. The turning radius, the driver’s perception of the weight of the vehicle, the manner in which the CrossCab takes road bumps—they are all more truck-like. One manner in which the Murano CrossCabriolet was not at all truck-like: cornering. Many SUVs feel top heavy to us, like we’re driving with a load of bricks on the roof. The CrossCab has a very light roof (when it has a roof at all). That significantly lowers the vehicle’s center of gravity and that, along with a the dual flow path shock absorbers and lightweight 4-wheel independent suspension, allow CrossCab drivers to take corners quickly and confidently. Such smooth cornering also adds fun to the ride. Smooth and quiet. Fun to drive, especially with the top down. Excellent cornering and adequate sportiness. Less-than-stellar gas mileage plus recommended premium fuel equals high operation cost. Normally, this is the part of the review where Spot Cool Stuff would compare whatever we are reviewing to its competition. 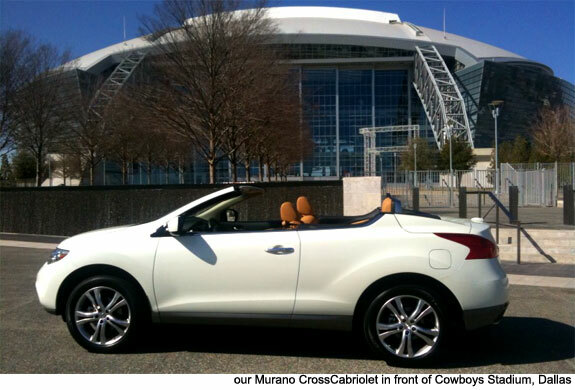 Problem is: there’s no vehicle on the market to compare the 2011 Nissan Murano CrossCabriolet to. Relative to other mid-sized crossovers the CrossCabriolet is expensive—about $6,000 more than a similarly equipped non-convertible Murano. The CrossCab also has significantly less cargo space compared to other crossovers. But then there’s no other crossover SUV where you can drive around with the top down (at least not without the aid of a chain saw). Relative to other convertibles the CrossCabriolet is a bit of a sluggish performer. You can zip around a lot faster in a Ford Mustang or BMW 650i convertible. But then even an Umpa Lumpa would find the Mustang convertible’s back seat and cargo space minuscule. As for the 650i convertible, it will set you back more than $90,000! All convertibles are, almost by definition, not practical cars. 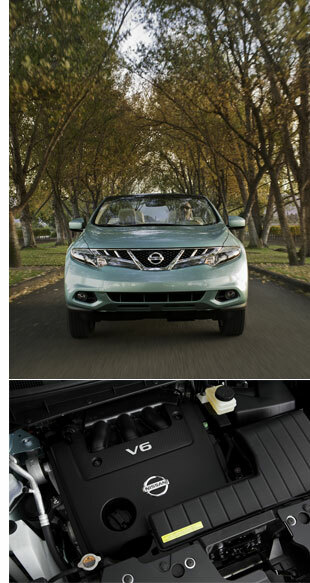 But the Nissan Murano CrossCabriolet is the most practical among them. For a convertible, it has superlative cargo and passenger space. In snowy climes, the CrossCab’s all-wheel drive, heated seats and 7.2-inch ground clearance make it a true year-round vehicle. 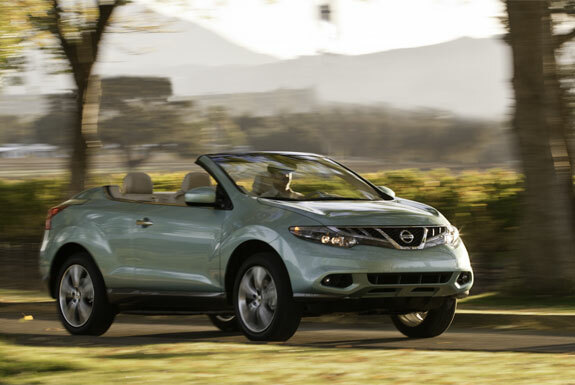 If the concept of a convertible crossover SUV appeals to you, choose a Nissan’s Murano CrossCabriolet with confidence. You’ll have fun driving it. And you’ll get a lot of attention while doing so. 1 The Chrysler PT Cruiser was the first convertible technically classified as a crossover. The car-like Cruiser didn’t look like a crossover to us and, in any event, new models are no longer on the market. 2 Spot Cool Stuff hereby declares “convertiablizing” to be a real word. As always your reviews are the BEST. I hadn’t heard of this car before but am not tempted.